Mahbubul Alam was born 1 December 1983 in Faridpur, Bangladesh. He is a Bangladesh cricketer who as of 14 August 2009 has played four Tests and four One Day Internationals (ODI). Despite having a first-class batting average of less than seven, Alam scored 59 from 43 deliveries in a One Day International against Zimbabwe in Bulawayo in August 2009. Right-arm medium-pacer Mahbubul Alam, who made his first-class debut in 2003-04, was included in Bangladesh's ODI squad to face New Zealand in October 2008 after impressive performances for the Academy side. Alam carried the momentum from a splendid run for Dhaka Division in the 2007-08 National Cricket League, in which he picked 39 wickets at 20.69 apiece, into his matches for the Academy, topping the wicket-takers' list on the tours of South Africa and Sri Lanka in August and September 2008. Find Mahbubul Alam profile and stats of batting, bowling and fielding including latest updated news of Mahbubul Alam, videos and images at Hamariweb.com. 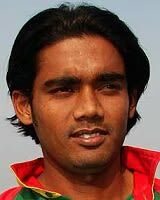 Also find detail Player profile and career statistics of Mahbubul Alam of Bangladesh. Mahbubul Alam - Find Mahbubul Alam of Bangladesh Cricket Team complete player profile, number of matches, runs score, wickets & catches, Statistics, Records, Mahbubul Alam Latest News, Mahbubul Alam Videos, Mahbubul Alam Photos, and other Mahbubul Alam Cricket Team players.